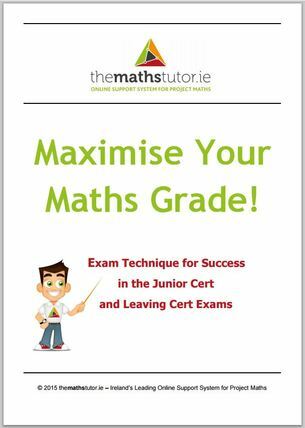 Top 10 Tips on Putting it All Down on Paper and Maximising Your Maths Grade! Home / Exam Technique / Top 10 Tips on Putting it All Down on Paper and Maximising Your Maths Grade! When your exam starts, your job is to score as highly as possiblebased on your current maths knowledge and ability. 1. Write reasonably clearly, work down the page and use a reasonable amount of spacing. You can always ask for more paper if you need it. Remember that for maths, you will write in the exam paper booklet, not in separate answer booklets. 2. Show all workings within your answer – do not do ‘rough-work’ on a separate page. 3. Don’t use Tippex – instead, cross out any errors with a single line. You might get marks for the work you have crossed out, but not if it’s Tippexed. 4. If you solve a problem using a calculator, write out some or all of the steps taken – don’t just give the answer. This is to ensure you get marks even if you make a slip. 5. Give reasons for your answers if required. 6. Drawing a diagram or even a basic sketch can often be very helpful to get started in tackling a question, and may gain marks for you. 7. Use your “formulae and tables” booklet – they include lots of useful information. (You need to get familiar with what is in it, and where, as soon as possible). 8. You should always graph paper for graphs and choose a sensible scale. Remember – on the maths answer booklets, just use the grid as your graph paper. 10. Probably the most important one! Never *ever* leave a blank answer – always try to get at least some marks for attempting the question, even if you feel you have no idea how to answer it. and tables booklet) with some substitution, or calculations should be written on the page to get “attempt” marks. the things for which the examiner gives “attempt” marks. Make sure you get them. Remember, the examiner cannot award marks for blank answers, so give them something to put marks against. “Attempt” marks can add up to better grades. Want more help to prepare for your JC or LC exams? We provide video lessons, exam technique and online support every night. Click HERE to get Full Membership now!